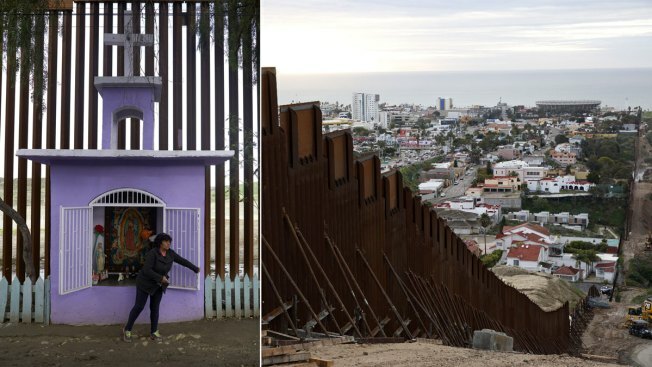 At left on Jan. 16, 2019, Esther Arias opens a window on a shrine built by her father, Jose Arias, as a newly replaced section of border wall sits behind, in Tijuana, Mexico. According to the U.S. Border Patrol, Jose Arias’ structure encroaches on U.S. soil, posing a dilemma for the Trump administration as it pursued a replacement of 14 miles of barrier stretching east from the Pacific Ocean: Should the shrine be saved or destroyed? At right, on Jan. 15, a section of the newly replaced border wall is seen from San Diego. For all practical purposes, the purple-and-white stucco shrine that Jose Arias built to celebrate his recovery from a heart attack and honor his family lies in Mexico. The only way in and out of his plywood shack is through one of Tijuana's oldest neighborhoods, a patchwork of dirt and paved roads where dogs roam freely and the sounds of roosters and power tools fill the morning air. The shrine's backside once rested against a wall separating the U.S. and Mexico, blocking passage to San Diego. But, according to the U.S. Border Patrol, Arias' structure encroaches on U.S. soil, posing a dilemma for the Trump administration as it pursued a $147 million replacement of 14 miles (22.5 kilometers) of barrier stretching east from the Pacific Ocean: Should the shrine be saved or destroyed? 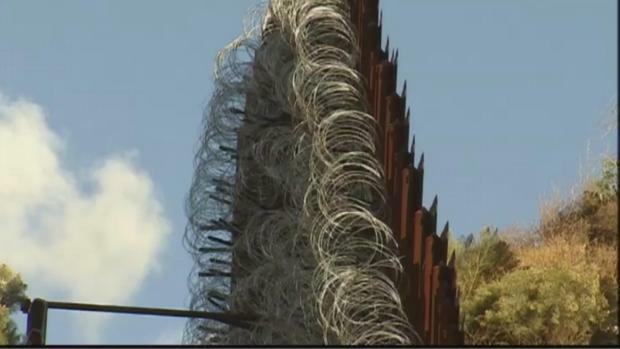 Less than a week after President Donald Trump ordered troops to start putting razor wire along existing sections of order wall, one town in Arizona is demanding it be taken down. City leaders in Nogales said the sight of the wires is harming the local economy. The Rio Grande marks the border between Texas and Mexico, ensuring that any land barrier on the U.S. side creates space between the wall and demarcation line established in bilateral treaties. One treaty limits construction on the Rio Grande flood plain, trapping homes in a no man's land between a wall built in the 2000s and the river. Rodney Scott, the Border Patrol's San Diego sector chief, initially thought the shrine was doomed but he sympathized with Arias as he learned more about it and a nearby shack belonging to Arias' daughter. "They're doing the best that they can with what they have," he said. "There was no malice, there's no intent. There was really no reason that they would understand that they couldn't build right up to the border." Arias moved to Tijuana in 1957 from central Mexico and settled in Colonia Libertad, a neighborhood where residents crossed — unimpeded and illegally — to work or play soccer and baseball in San Diego. "It was a free pass," Arias said. Scott, who grew up in the border town of Nogales, Arizona, where his father commuted to work at a Mexican factory, became a Border Patrol agent in 1992 and was assigned to a station a few miles from Arias' home. Thousands would gather on U.S. soil on a nearby soccer field and run past agents when night fell. Other large groups rushed inspection booths at a nearby border crossing. "We were arresting thousands of people in an eight-hour shift routinely and watching thousands more get away," he said. Border Patrol arrests in San Diego plummeted 96 percent from nearly 630,000 in 1986 to barely 26,000 in 2017. A factory outlet mall with upscale brands opened on the border, near new homes that sell for more than $500,000. An area called "Smuggler's Gulch" became nearly impenetrable. Scott described San Diego's transformation to President Donald Trump on live television when he toured border wall prototypes in March. Trump repeatedly touts San Diego as evidence that walls work, most recently in his State of the Union address on Tuesday. The crackdown pushed illegal crossings to less-patrolled and more remote Arizona deserts, where thousands have died in the heat. Border Patrol arrests in Tucson in 2000 nearly matched San Diego's peak. Critics say Trump's argument is undermined by the fact that building a wall in one spot will mean that migrants will find an opening elsewhere. "It wasn't, 'Do it in San Diego and stop.' It was, 'Let's prove what works and then let's copy it on the southwest border so we can improve security for the whole United States,'" Scott said. Trump inherited 654 miles (1,053 kilometers) of barriers, mostly built from 2006 to 2009, and has awarded $1 billion in contracts, almost all of it to replace existing wall. Work on his first addition starts this month — 14 miles in Texas' Rio Grande Valley. He wants another $5.7 billion for more than 200 miles (322 kilometers), but Democratic leaders in Congress have offered nothing, an impasse that led to a five-week partial government shutdown. A contract awarded in December will replace San Diego's steel-mesh barrier, which worked like a fortress a decade ago but is regularly breached with powerful battery-operated saws only recently made available in home improvement stores. President Trump is once again threatening to shut down the government over funding for a border wall. Speaking on CBS' "Face the Nation," Trump said ""I don't take anything off the table. I don't like to take things off the table. It's that alternative." 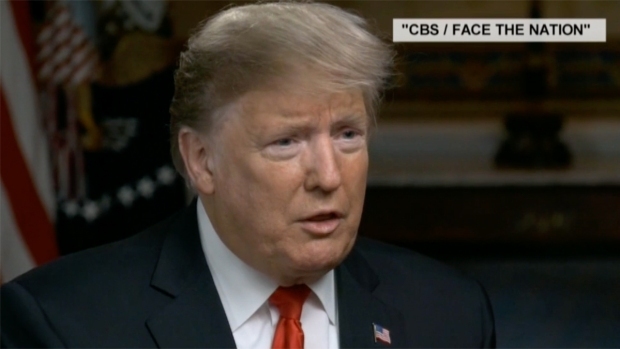 The president also said he's still considering declaring a national emergency in order to shift military funds toward wall funding. The Border Patrol is almost finished replacing the first layer with steel bollards up to 30 feet (9 meters) high. Agents couldn't see through the old fence, which was only about 10 feet (3 meters) high. A Mexican highway rose above the fence at one point and cars that ran off the road occasionally tumbled over it into the United States. "A lot of times border security is seen as adversarial and it's really not," Scott said after chatting with Arias' daughter through the new bollards. "Compassion and law and order can go together, and I think they do go together." "Why do you build a fence around your house?" he said. "To protect it. The (U.S.) government is building a wall to protect their country." "They respected my shrine," Arias said.